Peach butter lines a full and very wide and deep shelf in my cupboard where it will sit all tucked away and half-forgotten until January arrives and, in that coldest and whitest month, we finally remember it’s there. Our bellies will want for something soft and sweet. We’ll have had enough of wintered apples – sliced and stewed, in Dutch pancakes and in ferments and relishes, as apple pear sauce and spiced apple sauce with red wine. We’ll want for something that reminds us of summer, and that’s when we’ll stumble upon the jars nestled in the cupboard: peach butter – like a breath of summer in one teaspoonful spread with real butter over a slice of no-knead sourdough bread. Peaches arrived a month early this season – the first week of July. Each week since then, more and more arrive in our CSA – bags of them and we also pick a few cases up for a discount at the end of the market day (see these tips on shopping farmers markets so you can get similar deals). There’s always more than my little family of three can eat in a week – and what we don’t eat finds itself in my big canning pot (you can get one here), my fermentation crocks (you can get them here) or my dehydrator (you can get that here, too). If I’m steadfast enough in my approach, we won’t have to do any grocery shopping between October and April. That is, except for greens (which we intend to grow indoors this year) and occasional long-traveled produce as a treat. And that’s where easy-to-preserve foods like super green veggie powder, apple pear sauce and, of course, peach butter come into play. As you can imagine, at the end of the day I’m exhausted from working, from homeschooling, from emails and paperwork, and writing. Certainly, I feel far too tired to spend hours skinning peaches by scoring them, dipping them in hot water and then in cold so their fuzzy skin peels off easily (although a soft vegetable peeler with a serrated blade makes it a lot easier). Instead,to make this peach butter, I simply pit the peaches, puree them skins and all and simmer them with spices relying on their natural sugars to sweeten the fruit butter. I rationalize it to myself: well the skins give the peach butter flavor and color and more vitamins! Ultimately, though, it’s simply less work. You can preserve this peach butter any of three ways: freezing, canning or through fermentation. Each offers its benefits and each offers its drawbacks. Freezing: Once prepared and cooled down to room temperature, spoon the peach butter into resealable plastic freezer bags, BPA-free plastic freezer jars, or even glass mason jars (given enough head room to allow for expansion). Freezing retains more nutrients than canning, but is less cost-effective over time. Fermentation: To ferment peach butter, cool it down to at least 100 F, stir in fresh whey or a packaged vegetable starter culture (find it here) and place it into a fermentation crock (find it here). Ferment for 3 to 5 days at room temperature and store in the refrigerator for up to 8 weeks after which it will begin to lose flavor. Fermentation of fruit butters can actually increase the content of vitamins and food enzymes, but it will create a sourer flavor. It also will take up a lot of room in your fridge. Canning: To can the peach butter, pour it into canning jars, seal and process in a water bath. Time in the water bath will vary according to your altitude, so use a good book like the Ball Book of Canning to give you guidance. Canning results in the greatest loss of heat-sensitive vitamins; however properly canned foods like this peach butter are good for several years. If you’re ready to buckle down and preserve some of the bounty making its way from the garden and into your kitchen, you can typically find most of the tools at your local hardware store: canners and mason jars, but even now these can be hard to find. You can also purchase canning equipment for a good price online (see sources). If the BPA contained in the lids of most mason jars worries you, keep in mind that you can purchase glass canning jars with glass lids online, but they are woefully expensive. Peach butter is simple to prepare and wonderfully rich in flavor thanks to the addition of spices like allspice, ginger and cloves. Working in batches, toss the peaches in a food processor or blender, and blend until smooth. Pour peach puree into a heavy-bottomed stock pot, and stir in spices. Simmer uncovered over medium-low heat, stirring frequently, for about 60 minutes or until thickened into a fine paste. Blend until smooth with an immersion blender, pour into pint-sized mason jars and refrigerate or can using the water bath method. I’ve tried using mason jars in the freezer* but they’ve cracked, despite leaving head room. Do they have to be specific for the freezer? Thanks! I have had the same problem with my mason jars. plenty of head room. Chicken broth or soup cooled in the freezer. I have a few jars that have never cracked. Catherine, wide-mouth pint jars have no shoulder, and so are good for freezing with 1″ headspace. If you’re freezing in quart jars, you have to leave enough headspace that the level of liquid stays below the “shoulder,” or the curve of the jar. In a small-mouth quart jar, that can be almost three inches, and even a regular one it’s at least two inches. I also make sure that stuff is completely cooled before freezing, and *knock on wood* haven’t lost a jar in the freezer yet (just lost one in the canner yesterday LOL), and I also use non-canning jars (mayo, jelly, etc), sticking to keeping the level below any curve of the glass. Good luck! There are some made for the freezer, I have been using those for a few years now and have never had one of those crack. A teacher of mine once told us to prevent your jars from cracking when freezing, to lay them on their side. After they are frozen, turn them upright and store them how you like. I have always done this leaving plenty of headspace and I havent had a cracking problem. What a fabulous recipe Jenny. I’m thinking this peach butter would be so wonderful mixed into a morning bowl of soaked oatmeal. Maybe you can bring a jar to Wise Traditions in Santa Clara for sampling at the Farm to Consumer Oatmeal Bar Fundraiser breakfast (pretty please :)) ???? I might just have to! We’re very much looking forward to the trip! Yummmmm! peach butter and oatmeal? sounds like a perfect idea!!! Jealous of your trip- hope to make it to Polyface soon! Cheers! What about using apples instead of peaches? Yes. You can substitute almost any fruit for the peaches. I’d only use organic peaches using this method, as there is a lot of pesticide in the peach skins. Organic is implicit in all recipes on this site. 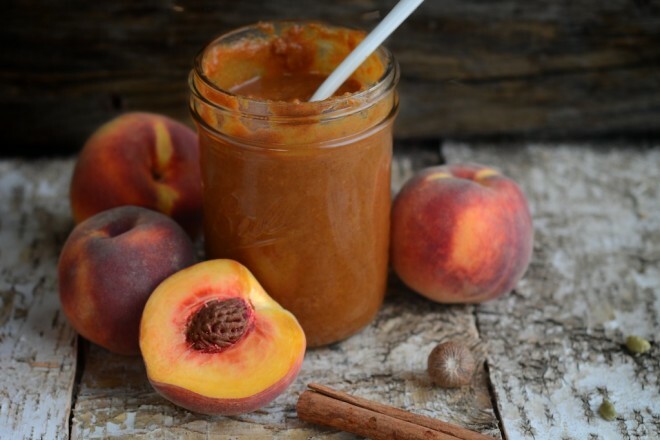 How do you use peach butter? I’ve never had it, but love peaches. I usually make jam and use it on bread, or in yogourt. Could I do the same with the peach butter? You can use this method to make a lot of different butters. I make peach, apple, pear, plum, apricot, tomato, and sweet potato. I’ve wondered how to spice peaches… but differently than just apple spices. The cardamom is the answer! I’ve wondered the same about pears also. The recipe sounds yummy Jenny! jpatti… I use cloves & nutmeg in pear butter with a little bit of lemon juice. I like to peel the pears since the skin makes the butter a little more grainy than I like. Yum! I just love all your recipes for “preserving the harvest”! Fruit butters are the best! 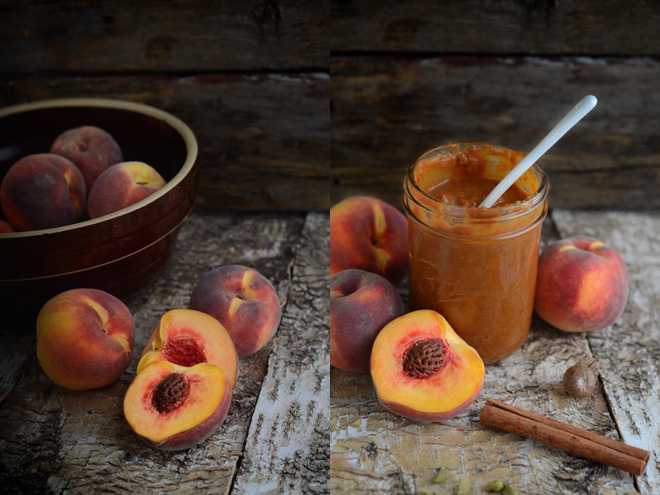 I make apricot butter, cooked low and slow its so easy and delicious! Thanks for the info on using the peach skins. I didnt know if they fuzz would be an issue. I would have been hesitant to try it. For a couple years now I have used the skins in applesauce and apple butter (which actually improves the flavor), and tomato sauce. I still put the peach in boiling water for a minute just to clean it off and get the fuzz off. You could also scrub them but that takes longer and is harder to do if they’re soft. Anyway, in the process of making this right now. So glad I don’t have to do anymore peeling. This is way less labor intensive than canning peach slices and halves. I guess I am a bit concerned not to see any lemon or vinegar in this recipe. Did you test the PH for canning? Emily, even the Ball Blue Book does not require acid for its peach butter recipe, it should be fine. Just to clarify…..you leave the skin on the peaches? Is it 15lb of peaches? Sounds yummy, what would you have it with? I’ve made a very similar peach butter recipe, but it was improvised! I could never replicate it . . . so glad to see your recipe! As for glass jars in the freezer? Both my fridge freezer and chest freezer are full of mason jars. I think I might have had one crack once, when I filled it very full and put the lid on before putting it in the freezer. Bone broth, soup, frozen macerated peaches, veggies, you name it. But I’ve always bought the jars that say “freezer safe,” because there is no way I would remember which was which. 🙂 Don’t know if that has made the difference. we picked peaches from our tree this morning and I have a batch going now. we are drooling the house smells so lovely! Could I use honey for a little sweetener and still water bath? I was thinking of adding the honey last after it has thickened up. This didn’t work out at I had hoped. Way too much cinnamon which over powers the lovely taste of the peaches. FYI, according to the labels on SOME of my boxes, Ball and Kerr lids are now BPA free. I didn’t really care for the texture with the skins in, it seemed like the fuzz didn’t break down and left a sort of grittiness on the tongue, but I only made a sample batch – about one pint’s worth 🙂 Peeling them IS a pain in the behind though. Food mill to the rescue! I love this, just curious, why is freezing it “less cost-effective over time”? I’m only guessing at her meaning, but I’m thinking because it takes energy (electricity) to keep it in its frozen state, costing more $ to preserve it. I live in a rural area in Southeast Missouri. I love peaches, but don’t eat them because I can’t find any organic peaches. Any thoughts on where I can get organic peaches that don’t cost an arm and a leg? I have found a few places that ship, but they are so expensive. Should I make sure to skin them if they are not fully organic? I cant find 100% organic peaches. checked farmers markets and amish! I’m making your peach butter now and wonder how thick is thick! I have been boiling it down for an hour, and it’s still a bit more watery than I’d imagine for a fruit butter, but maybe it will thicken when cooled? Anyone? This looks delicious! I have a canning safety question. While I appreciate that there is no sugar or lemon/acid in this, is this considered a safe way to keep something stored? There’s really nothing more to it than a water bath? I’ve read that peaches are actually quite acid. The real key here is that the proper acidity is met (and it is with peaches), but you can always test your batch with a PH Strip. That’s great to know. Thank you! Jenny! I tried this recipe and it turned out to be more of a peach applesauce than a butter. I cooked it for two and a half hours, stirring frequently. I eventually had to turn the temperature down to just low because it was spitting so much I kept burning my fingers when I went to stir it. The only butter-like substance I got out of it was the stuff I scraped from the bottom of the pot, which was actually really delicious but there was maybe 1.5 T of it. Any ideas as to where I went wrong? Is it too late to save this batch? While peach sauce is good, I really want that butter! I use a crock pot for making butters. Toss in whole fruit — if the stones don’t easily come out — and as the fruit cooks down, the stones release to float to the top to be fished out. COUNT YOUR FRUIT GOING IN. Then count the stones/puts coming out. One ‘lost’ pit in the immersion blender and a day spent washing every surface in the kitchen :-(. To thicken, leave the lid off bear the end, or lift with chopsticks/wooden spoons. I’ll blend everything, lift the lid to thicken and possibly add anything I think might add to the taste. I water process all my butters. On freezing in jars, I’ll leave the lids off for the first 12 hours or so, then add the lids. Always using straight sided jars, ie wide mouth Mason. I used to buy peach butter till the store went that sold it went out of business. Looked all over for it. I’m going to try making it but I wonder about cooling & storing in freezer bags. Does it have to be jars. If I use jars I might as well seal it so that it keeps on shelf. What does 15 pounds equate to in volume? We use ‘overripes’, which mean we have to cut out the bruised portions. This recipe had way too much spice for me. I put in half the amount of cinnamon and it still overpowered the peaches. I also added sugar because it wasn’t as sweet as I liked. I’ll make some changes for my own preference, but thanks for giving a starting point!